According to legend, in 1838 Stephen Warren, the first white settler of the Hartland area, walked from the city of Ann Arbor in Michigan to the WAUKESHA area in search of desirable farm land. Warren established a farmstead where his family joined him. The Warren family was followed by native-born migrants in addition to Swedish, Danish, and GERMAN immigrants in search of land to farm wheat. Christian Hershey built the first gristmill for processing wheat on the Bark River by in 1842. For a period the small community was known as Hersheyville. The construction of the Watertown Plank Road through Hartland in 1848 brought more settlers and business to the region. A small commercial district developed as taverns and saloons were opened to accommodate travelers. 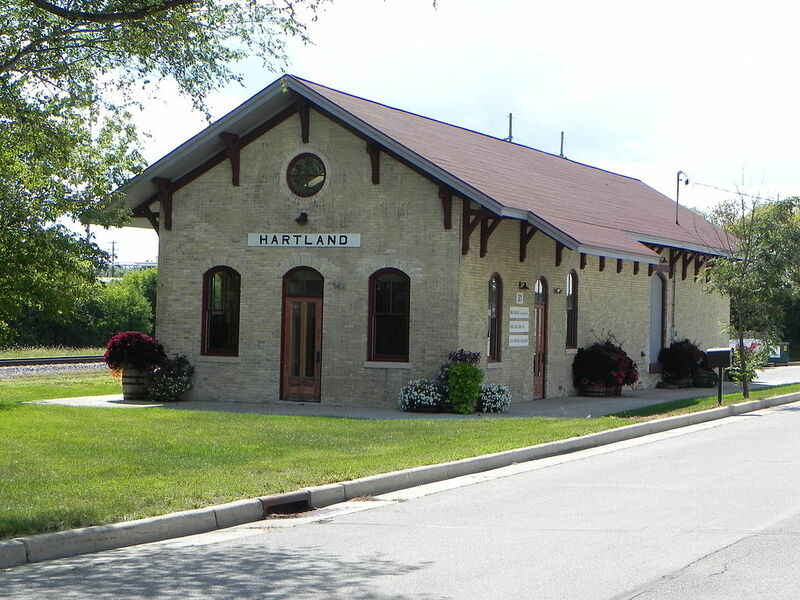 The Milwaukee and Watertown Railroad reached Hartland in 1854, promoting a further increase in commercial development and offering a faster and more efficient means of transportation and trade than the Watertown Plank Road. The Village of Hartland was incorporated in 1892. This allowed for the establishment of a permanent fire department and the construction of a gas plant to light city streets with gas lamps and to provide gas fuel for cooking stoves. In the 1890s summer homes and resorts built on the nearby lakes brought increased business from vacationers to the Hartland area. The resorts remained popular with vacationers through the 1940s. The development of new TRANSPORTATION infrastructure after World War II transformed Hartland from an agricultural community into a rapidly expanding bedroom community. THE MILWAUKEE ELECTRIC RAIL AND LIGHT COMPANY (TMER&L) installed an electric street light system in 1917 in advance of a planned electric rail line between the City of Milwaukee and the Village of Hartland. The connection was never made, as the automobile was rapidly supplanting rail transportation. The completion of State Highway 19 between Milwaukee and Oconomowoc made Hartland and the entire LAKE COUNTRY region easily accessible. Taking advantage of the new highway, TMER&L established bus service for commuters between Milwaukee and Hartland in 1922. Infrastructure and housing development in the village encouraged rapid population growth in the second half of the 20th century. Between 1950 and 1960 Hartland’s population increased by 75%, rising from 1,190 residents to 2,088. The population also more than doubled between 1970 and 1980 growing from 2,763 to 5,559. As of 2010 the village’s population was approximately 9,110, nearly eight times larger than it was in 1950. ^ Dorothy Hughlett, Hartland: A Chronicle, 1838-1976 (Hartland Wis.: Hartland History Group, 1976), 3. ^ Southeastern Wisconsin Regional Planning Commission, A Master Plan for the Village of Hartland, 2020, Waukesha County, Wisconsin (Waukesha, Wis.: Southeastern Wisconsin Regional Planning Commission, 2004), 3. ^ Master Plan for the Village of Hartland, 3. ^ Master Plan for the Village of Hartland, 9. ^ American Factfinder, “Profile of General Population and Housing Characteristics: 2010,” Accessed March 10 2012, http://factfinder2.census.gov/faces/tableservices/jsf/pages/productview.xhtml?pid=DEC_10_DP_DPDP1&prodType=table. Hughlett, Dorothy. Hartland: A Chronicle, 1838-1976. Hartland Wis.: Hartland History Group, 1976.